If you’re on the lookout for the best vegan hiking boots, you’ve come to the right place! We know that finding vegan-friendly shoes can be daunting, so we did the work for you! We found 10 great pairs of hiking shoes for your next hike that are animal product free! Before we get into the vegan hiking boot buying guide, here are just a few features you should be familiar with when looking for vegan hiking shoes. Let’s get started! 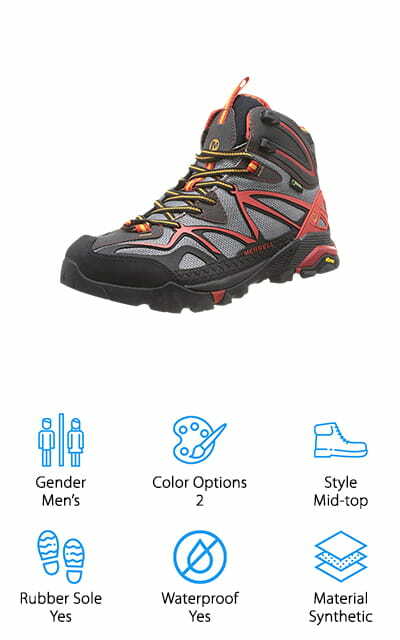 Gender: Whether you buy a pair of men’s or women’s hiking boots depends on your foot size, width, and shape. Men’s shoes tend to be wider and roomier in the toes, while women’s shoes are generally narrower and fit more snugly. Color Options: If you want to find a shoe that fits your style, we get it! We let you know how many color options are available if you want variety, or you want to buy off-gender and need a gender-neutral color option! 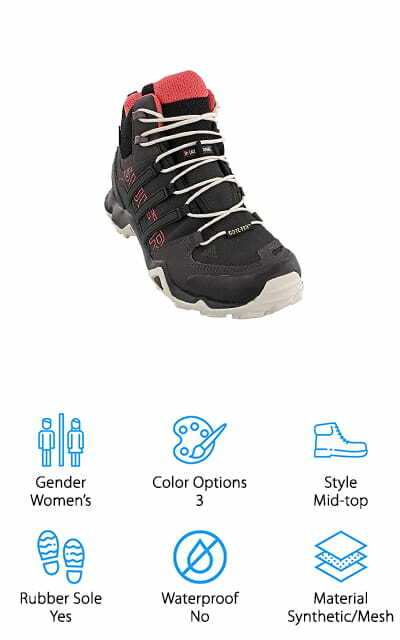 Style: Hiking shoes come in different heights: low-top, mid-top, and high-top. Low-top shoes look more like everyday gym shoes or running shoes, while mid-top and high-top shoes come up over your ankles to provide extra support while hiking in uneven terrain. Rubber Sole: Rubber soles are important to have when hiking. They are durable, waterproof, and provide extra support to prevent injuries while hiking in rough or uneven terrain. Rubber is also a great vegan-friendly material as it’s eco-friendly and doesn’t harm animals! Waterproof: Depending on where you hike, you may want to pick up a pair of waterproof shoes. They keep your feet dry and comfortable, which is important to keep you cool in hot weather and to prevent frostbite in cold weather! Material: We did the research to make sure each shoe is made of vegan-friendly materials. They are typically made of synthetic fibers and mesh or vegan leather, so you can feel good that you’re buying a great shoe without animal products! Now that you are familiar with the different features of hiking boots for vegans, let’s get into the reviews! We found 10 different pairs of hiking boots for men and women alike, so you can find the right fit. There are a variety of styles at different prices to suit your needs, too! If you’re short on time, no worries! We started with our Top Pick and Budget Pick, so start there and come back when you have more time! 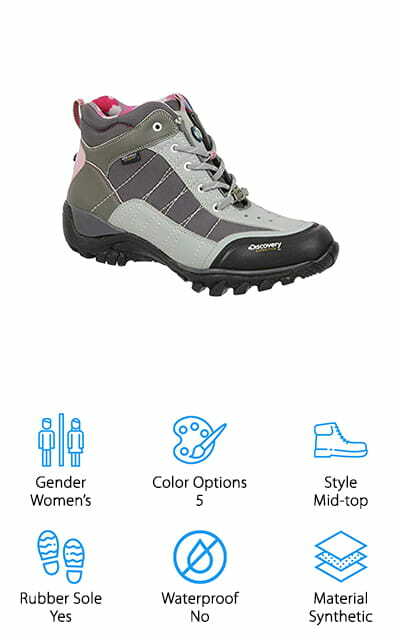 First up is our Top Pick for vegan hiking boots that both men and women will enjoy wearing, even on long hikes! These mid-top men’s boots have everything you want in a hiking boot – without using any animal products! The shoe itself is made of a synthetic Gore-Tex fabric that is waterproof, giving you extra protection while hiking through water or mud. The fabric also works well to wick away sweat within your shoe, keeping your feet dry and comfortable. We also like that the insole uses Uni-Fly shock absorption padding on the ball and heel of your foot, so you can move around comfortably. It also has antimicrobial agents to reduce odor and bacteria growth, which means your shoes will stay fresh longer! The rubber sole is also heavy duty Vibram, which gives you stability where you need it, and flexibility at the arch for better traction and control on uneven surfaces. This is an all-around great vegan-friendly shoe! If you’re looking for the best cheap vegan hiking boots, definitely check out this pair from Jambu! 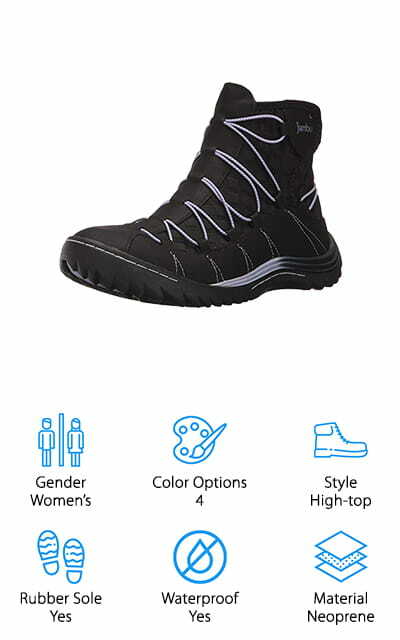 We like that this is a slip-on pair of boots that are perfect for wet and cold weather hiking. The high-top design keeps feet and ankles well protected from the elements, thanks to a vegan-friendly and waterproof neoprene covering. They have a bit of a roomy fit, so they are perfect for adding an extra pair of thick socks in cold temperatures, keeping your feet warm while still fitting comfortably! We like that these shoes are lightweight and comfortable, with a memory foam insole that protects your feet without adding extra bulk to the shoe. The rubber sole is also sturdy, yet flexible enough to give you more control on rough surfaces. It’s also made of partially recycled rubber, which is great for the environment! 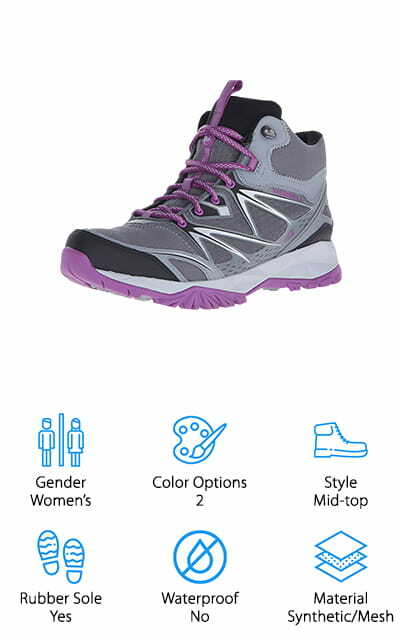 For the price, we think these are a great pair of hiking shoes for your next snowy adventure! Next up is this sturdy pair of vegan-friendly boots from Manfen that are absolutely perfect for snowy days! 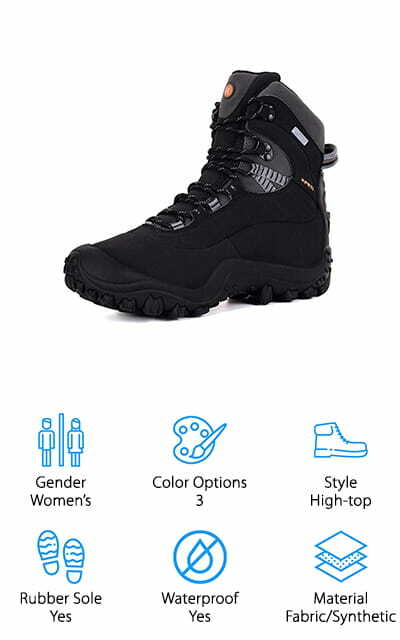 This is a waterproof, well-insulated hiking boot that will keep your feet well protected from snow and water. We like that these fit snugly, giving you extra stability in the ankles to prevent rolling or sprains. If you have larger feet or plan to wear thicker socks, you may want to size up to get the best fit. We like that the rubber sole is thick, full of traction for slick surfaces like ice and rain. The sole also extends over the toe to keep them safe from stubbing or slipping! Oh, and the back heel has a thick strap to tie on your snowshoes for some extra fun in the snow! We think these are a great pair of hiking shoes for vegans who want to enjoy the snow without needing fur or leather to keep your feet warm and dry! Are you a trail runner that wants something a little more robust than running shoes? Grab a pair of these mid-top hiking shoes from Merrell and hit the trails! These vegan-friendly, waterproof shoes look and feel like your typical running shoes, but they have a mid-top style to give you extra ankle stability. We like that the synthetic and mesh tops keep your feet dry by repelling water and wicking away sweat inside at the same time! The insoles use the same Uni-Fly insoles as our Top Pick while preventing bacteria and fungus growth, so your shoes will smell fresh for longer! The soles are made of thick, sturdy rubber that provides plenty of traction on uneven surfaces like gravel and rocks, or slippery surfaces like wet concrete or asphalt. If you prefer to speed through your daily hike, these are a great hiking and running hybrid shoe to keep you running smoothly and safely on just about any surface! If you’re more of a backpacking enthusiast, consider picking up a pair of these inexpensive and durable hiking boots from Discovery Expedition. They are great if you have small or narrow feet because they are made to fit rather snug. If you don’t have narrow feet, don’t worry – just size up to get the best fit! These mid-top boots have plenty of padding in the ankles to give you ample support while still being able to flex and move. The synthetic, vegan-friendly leather and mesh outer materials look like the real thing, and they work like it too! The sock lining is cozy and cushiony to keep your feet nice and warm, even on long hikes in cooler weather. We also like that the rubber soles have a lot of traction, so you can feel confident each step of your journey. Even if you’re carrying a heavy, cumbersome backpack, these shoes will keep you steady on your feet for miles! In our search for the best vegan hiking boots for sale, we came across this pair of minimalist hiking boots that we think our vegan and environmentally conscious barefoot runners and hikers will enjoy! Xero Shoes specializes in creating ultralight, durable shoes that allow your feet to move around freely for a barefoot-style experience. The flexible mesh upper is water-resistant and breathable, keeping your feet dry and cool during long hikes. We also like that the mid-top design gives your ankles a little extra support, while still allowing you the freedom to move and flex over rough terrain. The shape of the shoe is also a major plus for barefoot-style hikers, with an extra wide toe box to give your toes room to spread properly for more comfort and stability. The rubber soles are durable with plenty of tread to provide grip, but they’re super flexible to give you the barefoot-like experience you’re looking for in a minimalist hiking boot. Adidas has been a trusted brand in running shoes for almost 100 years, and their hiking shoes are the same high quality you have come to trust from them! 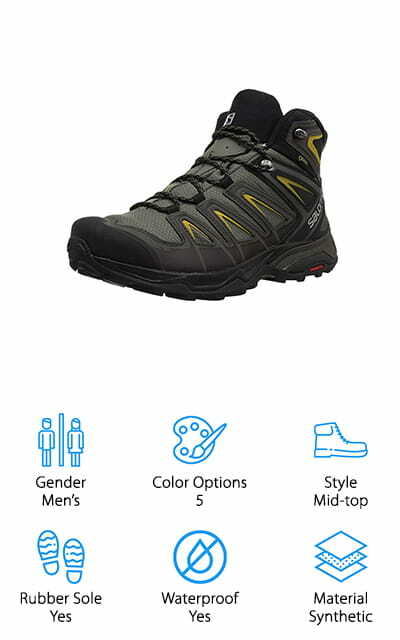 This pair of mid-top hiking boots is a nice hybrid of a hiking boot and running shoe. We think these are great for hiking, trail running, and even pavement running for those who need extra ankle support! The upper material is synthetic, vegan-friendly mesh that keeps your feet comfortable and dry on long hikes or runs. We also like that the rubber soles have a lot of traction, which is perfect for muddy and rocky hiking. They’re also great for running on slippery grass or pavement! We find that these run a little on the narrow side, which is great if you have narrow feet, but you may need to size up if you have wider feet for a great fit. With 3 stylish options, these shoes also look great, too! If you have wide feet, finding hiking boots that fit can be a struggle – but not anymore! These hiking boots from Salomon are made for wider feet, and they’re vegan-friendly! 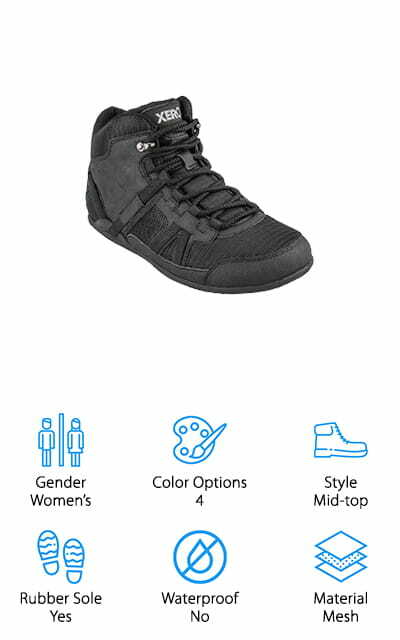 The mid-top boots are sleek and simple in design, so they are perfect for both men and women to wear with their hiking gear! We like that these boots have tons of support inside the shoe to keep your ankles and heels in place while ascending or descending sharp inclines. The Gore-Tex upper is waterproof, comfortable, and wicks away moisture to keep your feet dry, even on hot, sweaty climbs! Rubber soles keep your feet stable, with tons of grip to help you navigate slick rocks or gravel with ease. Whether you have wider feet, or you want a roomy pair of hiking boots to fit extra thick socks on winter hikes, these are a great option to give you the space and stability to tackle your next mountain climb! Another option for wider feet is these low-top hiking shoes from EpicStep, which we think are great for hiking and trail running! 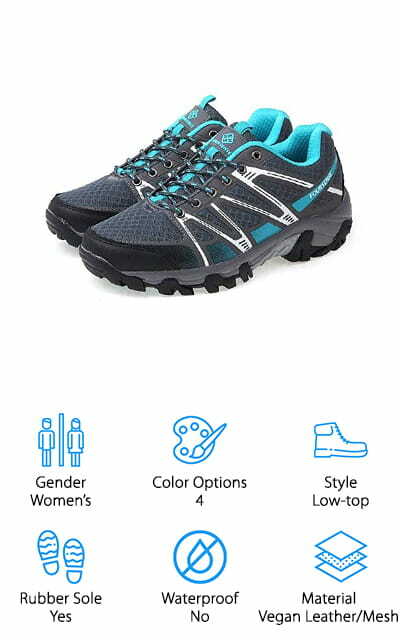 They look just like regular running shoes, and they come in 4 bright and fun color options to match your style. The vegan-friendly faux leather and mesh uppers are flexible and breathable, so your feet will stay dry and happy during long hikes or runs. The radiant rubber soles are also great for tackling rough terrain or slippery pavement on your daily run! They have tons of thick grips to handle mud, gravel, and rocks, which helps prevent injuries. We also like that the soles are more flexible under the arches, which gives you a wider range of motion to give you even stability on uneven ground. If you have narrow feet, consider sizing down a half-size to get a snug and secure fit. For the vegan trail runners in your life, these would make a great gift! Last up in our vegan hiking boot reviews is this pair of women’s high-top hiking boots from XPETI. 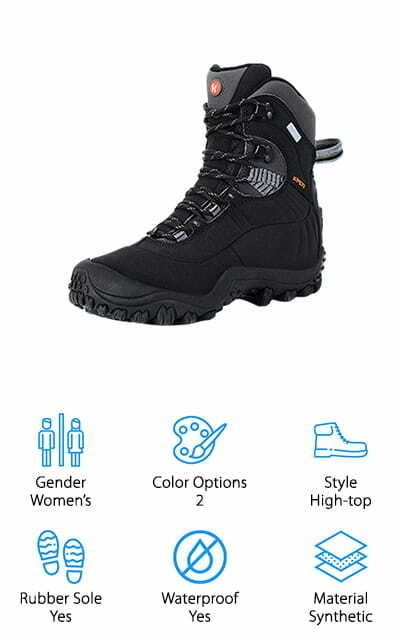 We think these are a great pair of boots for taking on your next winter hike, whether you plan to trek through rain, mud, snow, or ice! The high-top design keeps your feet and ankles well protected from the elements, thanks to a waterproof mesh upper that’s animal product free. To keep your feet warm in chilly temperatures, these boots have Thinsulate insulation that works down to 30 degrees Celsius! The rubber soles are thick and sturdy, with tons of grip for snow and ice. We also like that the soles fit up over the front, giving your toes some extra protection from kicking or stubbing them! Since these are women’s shoes, they do fit a bit snug. If you have wider feet or plan to wear extra socks to stay warm, consider going up a size to fit your feet better!